I remember smelling my grandpa’s pipes, pulling them one by one from an immaculately polished brown leather box kept on quiet display in his den, lifting the lid and instantly being transported to another era. Though I never saw him smoke them, I remember picturing him young—a dashing soldier in his twenties, courting my grandma, puffing a pipe all gentle-like. I could smell that sweetness in the air and on his skin. The smell of a good pipe strikes a note of palpable nostalgia, even for those without direct associations. 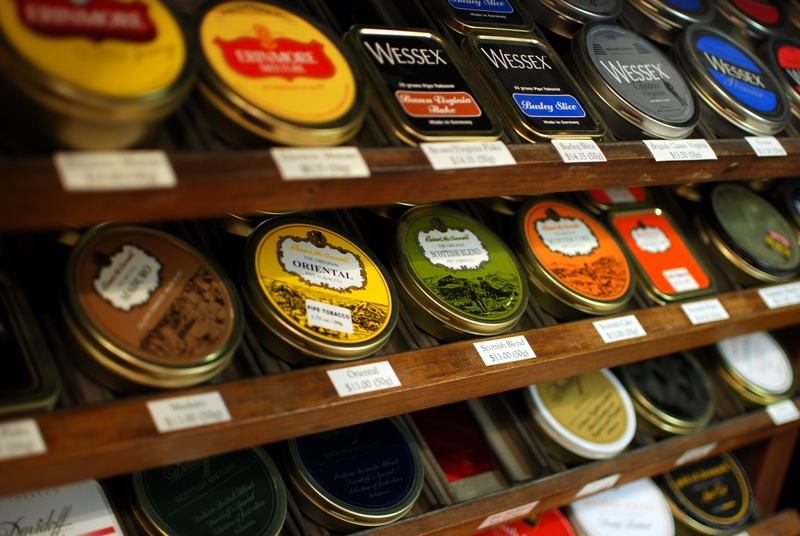 It’s almost as though the marriage of sweet tobacco and burning wood sprung forth far enough back in history that it exists in our collective memory. Comforting. Relaxing. Swathed with manliness and class. That’s what the Iwan Ries family stands for. 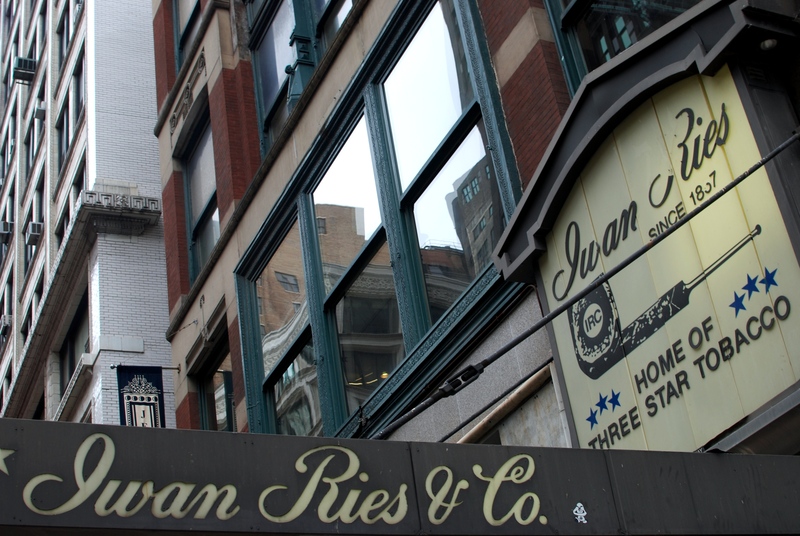 Iwan Ries, the oldest family-owned tobacconist in the country, has touched three centuries and passed through five generations of one family. A phenomenal boom in the fifties and sixties gave the family-run business the momentum to develop their own brand of tobacco, Three Star Blue. They launched a catalog and mail-order service, and began filling orders worldwide. Ries’ daughter Rosalie married Stanley Levi, and Ries passed the business onto his son-in-law. 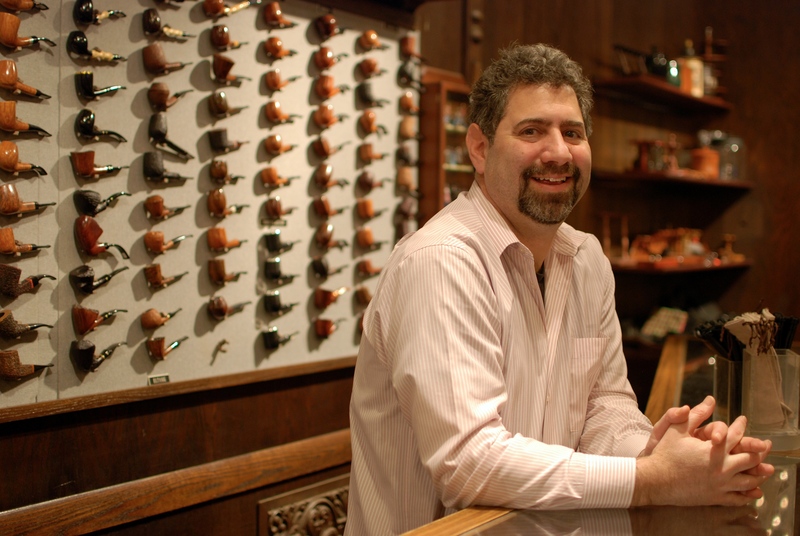 The current owner, Chuck Levi, joined the business as a young man in the fifties, allowing his father to travel the world and gather pipes never before available to American consumers. His own son Kevin Levi now manages the business. With so many years past and so many millions poured into commercial cigarette campaigns, it seems an establishment devoted exclusively to cigars and pipes would be fading into the sunset. Then again, you simply wouldn’t be giving enough credit to Chicago’s under-thirty crowd. This tobacconist is a business that has free wireless Internet. In a classier rendition of freelancers working from coffee shops, Kevin says they have a couple of lawyer customers who like to set up their laptop and work in the lounge so they don’t get interrupted. Iwan Ries has a website and a Twitter account. The modern business practices are seamlessly woven around an ancient, solid framework of exceptional customer service and an impressive inventory gathered from all over the world. 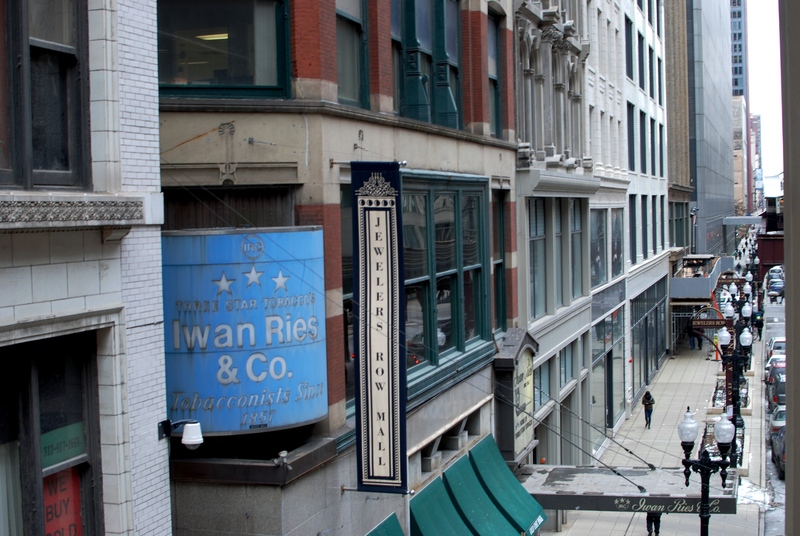 And so while sales have diminished in recent years, Iwan Ries’ customer base has expanded. More people are buying less. Affluent lifetimers puff next to their understudies in the recently renovated smoking lounge, sitting in black leather club chairs and listening to jazz. Intricately carved dark wood-panel walls climb floor to high ceiling, retaining a bittersweet musk that lures you in and invites you to stay. Next to the window, pawns slide across a chess board between two men in their sixties; outside, trains circle the Loop, steel tearing across steel, sparks flying and dying, commuters packed shoulder to shoulder gripping cups of coffee and bags. Kevin says that while they let the last customers in at 10pm, the smoking lounge stays open until the crowd dwindles and the remaining loungers are ready to leave—sometimes at one or two in the morning. Young and old, Iwan Ries customers are nothing if not loyal. 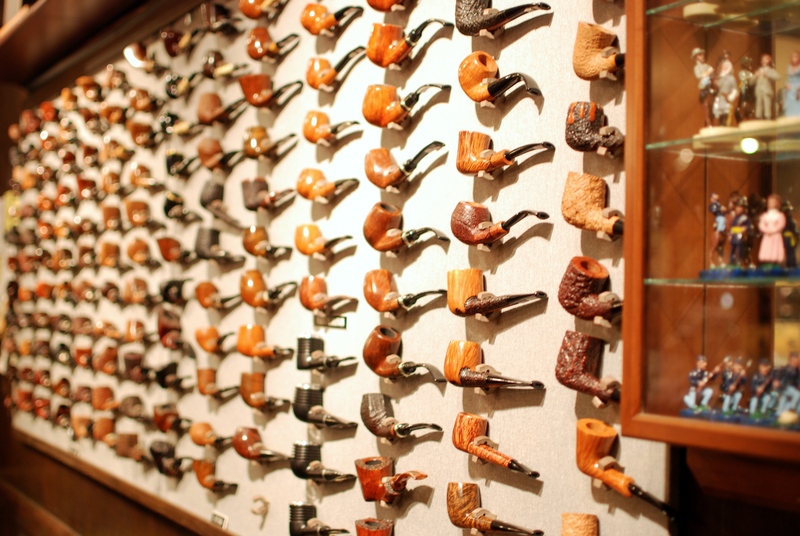 Leagues of devoted patrons cross the world to enter these doors, coming from far reaches to pick a custom pipe. They know the name of the person who grew their tobacco and where he grew it. They know the biography of the artist who spent years perfecting his style to make the pipe they put to their lips. 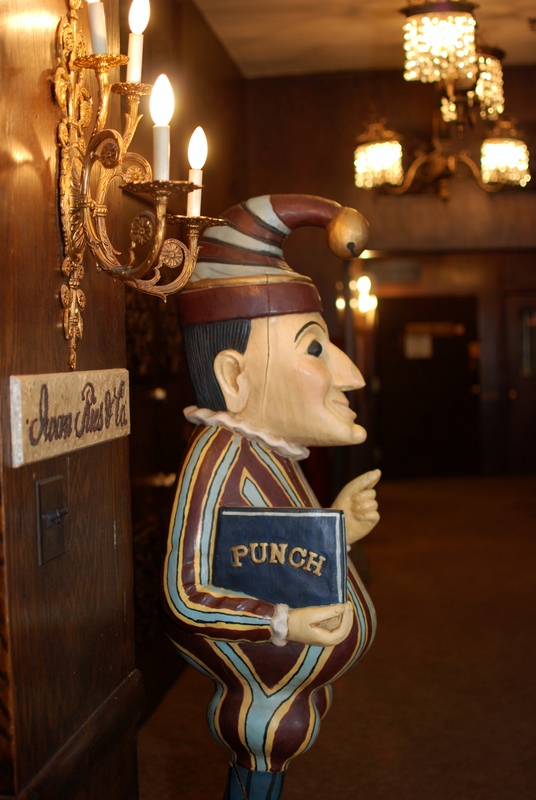 Established in 1857, just twenty years after the city of Chicago itself, Iwan Ries credits their enduring success almost entirely to impeccable customer service, a priority set in place by the original owner, German immigrant Edward Hoffman. Hoffman chose Chicago’s legendary Sherman House Hotel as his first location with a vision of providing only the finest pipes and tobacco products to droves of city workers and thousands of hotel guests who would remember the experience and returned for new stock on every visit to the Windy City. His vision proved viable, and the business, then known as E. Hoffman & Co., took flight with relative ease. The business moved for the first time when the Sherman House Hotel building was lost to the Chicago Fire of 1871. No need to point out the irony. After the fire, E. Hoffman & Co. rebounded, rebuilt and proceeded to flourish and expand. Realizing that the business had grown into more than he could handle alone, in 1891, Hoffman brought in his nephew, Iwan Ries, from Germany. In 1898, Hoffman left the business to Iwan and approved the permanent name change. The roaring twenties brought hordes of land developers, and the spirited business rolled with the punches, getting pushed from one location to the next as old structures were torn down and replaced by modern buildings, stacked and sprawling across the city. Iwan Ries kept building stock, maintaining the largest and most diverse selection of pipes and tobaccos in the world. Wherever they moved, their loyal customers always managed to find them. Now Chuck and his wife Susan are 73. They still work full-time, with no sign of stopping. Kevin admits it’s not always easy working for a small family business. When I ask him about it, he gives a stock answer about how great it is to be part of a family business. Then he pauses and asks me, “Do you have a mother?” I tell him I do. “Would you want to see her all day five days a week when you’re 40?” he asks me. “Don’t get me wrong… She’s the most wonderful, loving mother. But, you know.” While Kevin is resolved never to put any pressure on his own three kids to continue the business, right now, it’s home for the family. His kids love coming in to visit the store, their dad and their grandparents. Iwan Ries now sits tucked up a set of stairs off Wabash, perched eye level to the El, chandeliers shaking and glimmering a little extra every time a train goes by. The historic 19 South Wabash building, designed by Adler & Sullivan, was built in 1881 and purchased by the Iwan Ries family in 1968. The facade is currently being restored, but the interior remains well-kept if settled-into. Kevin likes to keep quiet about the shop’s clientele, but after a little prodding, he tells me Rudy Giuliani hung out here last week, and John Lithgow before that, and Mickey Rooney before that. There’s mystique. Having opened in full-force following Chicago’s indoor smoking ban, Iwan Ries’ lounge in some ways feels rebellious: a safe haven for those kicked to the snowy curb with tobacco in hand, and it’s BYOB to boot. Iwan Ries hosts all manner of private parties, but the general rule is to keep things classy—as in, this is exactly where you want your fiancé to have his bachelor party. The smoking lounge is members-only—though all are welcome for a day rate of $15. It’s populated primarily by dedicated cigar smokers. It would seem pipe lovers, with their dramatically less-offensive aroma, are less-often banished from their homes. 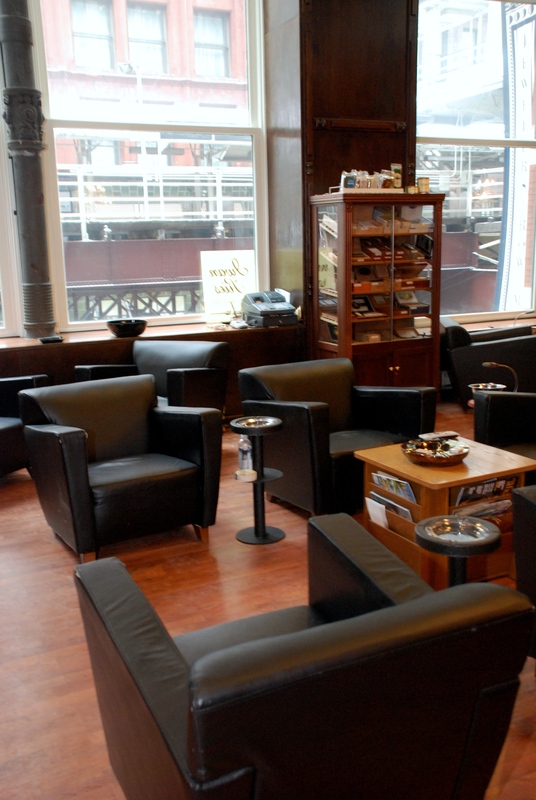 But customers, mainly young ones, are primarily buying pipes, which now drastically overpower Iwan Ries’ cigar market. Kevin attributes this to a younger consumer base as well as a growing number of people using pipes as a way of easing off cigarettes. Plus, there’s the romance of it. “It’s more contemplative, and it takes a while, so you can read,” he adds. Pipe smoking is a porch-sittin’ activity. You won’t see pipe smokers much on train platforms or huddled outside bars on Friday nights, for the smoking of a pipe is a practice to be savored. In itself, a pipe actually takes a remarkable amount of time to burn through—up to forty minutes on a single bowl—and the time spent doing so becomes naturally introspective. Not long ago, I followed the familiar scent to a third-story balcony in Wicker Park, called up and joined two 27-year-old buddies to witness their charge. The wind had taken on that sharp November crisp, so the plumes of musky vanilla smoke appeared thicker, whiter, with a life and presence of their own; sliding from the sides of mouths, they lifted and swirled before dispersing into the air and the weaves of their makers’ sweaters. The evening had a distinctly eloquent air to it, as though important matters had joined these fellas and demanded to be hashed out—quietly in their minds and gently with each other. Sitting side by side in strong wooden chairs, they faced Wicker Park itself, and beyond it, the glow of sleepless, electric Chicago. In a market dominated by $9 packs of chemical-ridden Camel Lights, it sometimes feels like class is a bygone notion. But these men were fresh new relics of the past. Dan is clean-cut, wearing a tidy sweater vest and polished loafers. Dave wears a rugged black leather jacket with peaked lapels, purchased from a thrift shop somewhere in the hills of San Francisco. He has jeweled rings on many of his fingers, and despite his position at a prominent PR firm, his hair grazes his shoulders, soft and wavy. Dave and Dan pause between sentences and point at each other with the pipes. They are tending to themselves and to each other, and also to each of their own pipes, making sure to puff enough to keep it lit, but not too much to burn it out. This is not an activity of a drunkard. And I can’t help but think that all this is coming from a deeper place in their beings. The raw things that built us way back when now hold a luster, a mystique, and we’re trying to find our way back to them. We eat whole foods now and we contemplate cooking for ourselves. Perhaps cigarettes are like TV dinners in the progressive smoker’s mind, and the holistic approach just might be pipe smoking. I found my own objections to tobacco use more and more difficult to maintain the more time I spent in Iwan Ries. As he stands behind the counter, Kevin will tell you that studies have shown that pipe smoking only slightly increases mortality when compared to non-smokers, and the effects are nil compared to the cancerous rampage that cigarettes take on your system. One Swedish study even found that pipe-smoking twins lived longer than their non-smoking counterparts. By my third visit to Iwan Ries I was ready to throw in the towel. Following a yoga class in the South Loop, I walked up old Iwan’s steps and picked out a corncob of my very own. It was a blondie, nice and light in tone, with dimples on the side for traction. I’d studied the packing style of the boys in Wicker Park, how they keep the density even throughout—not too tight, not too loose. I filled her up with Iwan’s own Three Star Blue and lit it. Quick, even puffs just into the mouth, no further. The opposite of the deep yoga breaths I had taken. The moment she lit I could feel it, thick plumes drifting casually out of my mouth, sweet tender vanilla caressing my face. Hello friend. It had been years since I smoked anything at all. Camel stopped making their delightful flavored cigarettes, I started getting acupuncture, and I started caring about my health. But something about this just felt right. And though no regular was made of me, smoking and I came to an understanding. I found an appreciation, a respect. Pipe smoking was an antidote to the nerves. A mechanism for reflection. I felt comforted imagining my grandchildren one day finding that blonde corncob of mine, twirling it in their fingers and knowing that their yogi grandmother had untold facets they had yet to explore. As I cough my way through crowds of cigarette smokers outside bars, I know that quiet, calm Chicago balconies and living rooms hold people sitting together in contemplation, breaking in their new companions, conversation rolling like molasses. These people are moving our landscape both forward and back, defining themselves just a little with each breath, and finding themselves in the musky plume of history.